OHM Natural (Yellow) Pipe Tobacco, offered in yellow and black packaging, features 100% additive and preservative free, whole leaf, natural tobacco. This tobacco blend is the perfect choice, affordable and available at a low discount price! 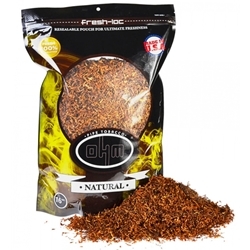 Enjoy the superb flavor of OHM Natural Pipe Tobacco! 16 oz. (450g) (1 pound) Moisture-Control Resealable Pouch. OHM Natural Pipe Tobacco is one of the very few brands that offers US grown, 100% additive and preservative free whole leaf, natural tobacco. Every OHM Natural Pipe Tobacco is filled with a high-quality flavor blend, made only from natural, additive and preservative free ingredients. 100% certified tobacco offered exclusively to you by Smokers Discounts!